7 AJCV-4A56 No damage from enemies, explosions, hazards, etc. 1 Invincibility At the title screen, select Options, Jukebox. Press C to play the tunes in the following order: 3, 12, 17, 2, 2, 10, 2, 7, 7, 11. Start a game and you will be invincible. strange twist of fate, gets sucked into his own creation. concept, a well-designed story, and decent gameplay. ya! What are you waiting for? Go get it - now! 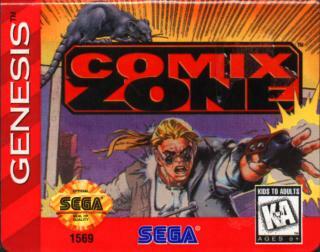 A Great Game, Imagine yourself Inside a comic book Fighting hand to hand combat to defend your very own life! yhea this games kinda like that... BUT BETTER! Go check it out! Finally, i can agree with the scribe, this is a great, fun, unique game, in which you play through a comic book, beating up baddies, get this game! 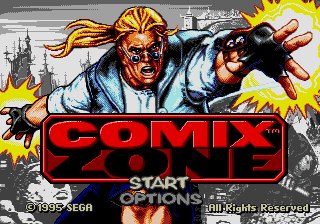 This is one of the All Time Greats Of Sega! 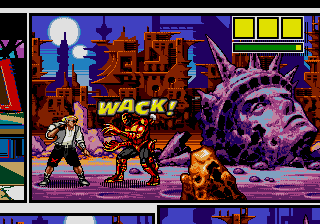 Im getting Sega Nomad mainly for this reason (This game was on the box of Sega Nomad) Anyway This is a great game you are Sketch Turner, a Artist Traped in his own comic! Can you escape? well even if you can't it sure is a hell of a good way to lose your life! 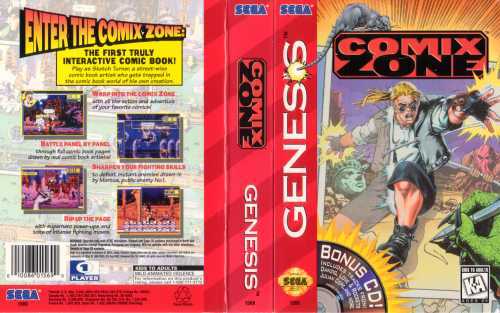 Comic plus Sega??? it cant equal any thing but GOOD! This incredibly original game is what any sidescrolling "beat 'em up" fan should add to their collection. Sketch Lampoon (...y-yeah...), a comic-book artist, has been trapped in one of his comic-books, and he must fight the villians he's created to escape. Okay, so the concept is odd, but it works well, sporting original gameplay, impressively "active" graphics, and sound that really fits with the game's atmosphere. If you haven't done so already, give this gem a go. Another very innovative game !!! a portion of your life. 6 at the jukebox screen. A voice will say "Oh Yeah"
to desired level and press C.
Goddamnitt! This has to be one of the coolest games I've ever played, and definitely one of the top titles on the Megadrive. The graphics stretch the console to its limits, and the music is also brilliant. The game itself is very fun to play and extremely original. If you don't own this game, and see it on the shelf of your old retro-gaming store, buy it without hesitation! If you see it covered in dust in an old video rental shop, pop over to the bloke at the till, and offer him a fiver for it. If you already own it, get it out of the cupboard and slot it into your Megadrive! You could do a lot worse with an hour of your time! MAN WHAT A GAME! This one is unique, you throw your'e enemies through frames of a comic! This one may have been overlooked but the passing time will look back to this game kindly as it can hold its head up high to be among the best games released on its platform. A very hard and poor game.